By the time he arrived in Paris in 1955, Chu Teh-Chun was already a professional artist. His profound knowledge of painting combined with his astonishing technical mastery make him an exceptional representative of modern Western art. Born into a cultured family (his father was a doctor and art collector), he studied painting from a very early age, an imperious calling served by talent and an aptitude for hard work that soon led to his being considered one of China’s leading artists. A graduate of the School of Fine Arts of Hang-Zhou (1941), his ability to reproduce traditional masters while assimilating contemporary styles led to his being appointed professor at the Central National University of Nanjing from 1944 to 1949, and then at the National University of Taiwan from 1951 to 1955. He was already leaning towards Western painting, which in his opinion was more suited to expressing a modern sensitivity, and was influenced first by Impressionism and then by Fauvism, the characteristics of which permeated the works he exhibited in 1954 in Taipei, Taiwan. In Paris he hurried to the Louvre to see for himself the works that he already knew through mediocre reproductions. He installed himself in a hotel in rue Lhomond and learned French at the Alliance Française while attending classes at the Grande Chaumière. In the evenings, he painted in his room. Several decisive encounters then introduced him to the capital’s art world: Albert Féraud, who had won the Prix de Rome for sculpture and who was now back from Italy, and above all Père Régamey, who put him in contact with Père Vallée, a Dominican at the Saint-Jacques convent who, in 1954, had founded the Galerie du Haut-Pavé, at number 3 quai de Montebello, where he showed the work of Bellegarde, Laubiès and Longobardi. Sacha Klerx, the artistic director, was very enthusiastic about Chu Teh-Chun’s paintings, and organised his first Paris exhibition in 1958. In the meantime, the artist had assimilated various art movements. In 1956 and 1957, he exhibited some portraits at the Salon des Artistes Français, which were awarded a prize. The first retrospective of Nicolas de Stael’s work had taken place in 1956 at the Musée National d’Art Moderne, and Chu confided: ”It was a real revelation of the freedom of expression to me. From now on I freed myself from my twenty years of figurative work to follow my path in non-figurative painting. I slowly turned towards the inspiring thinking of traditional Chinese painting. I discovered the poetry in it and its way of observing nature which is close to Western neo-impressionist painting and particularly to abstract art. Working unconsciously on a synthesis of the two cultures, I suppressed emotion as the driving force and prolonged it through pictorial expression” (interview with Gérard Xuriguera, Les Années 50, Arted, 1984). These paintings were exhibited at the Galerie du Haut-Pavé and also shown at the Galerie de Beaune (1958). Around this time, he met Michel Ragon, then the artistic director of the Galerie Le Gendre. Replaced a few months later by Maurice Panier, he concluded a contract with Chu-Teh-Chun that lasted until 1963. Chu became friends with the gallery’s other painters: Arnal, Bott, Corneille, Revel and Sugai. Three exhibitions were held: in 1960, 1962 and 1963, accompanied by a preface by Gérald Gassiot-Talabot, who wrote: “His painting flows naturally, warm and vibrant, impervious to definitions… it is a lyrical offering murmured in the secret of a serious life of meditation or bursting out noisily like a hymn, when the artist rediscovers the phrasing of great T’ang layouts.” We observe a process which at the same time as it leads him to abstraction permits him to reconnect with his original sources and express himself with total freedom. His paintings invite us on an inner journey that evokes the primordial relationship between mankind and the universe. They are the visual symbol of the artist’s constant dialogue with nature. To start with, the forms are large dark stains that seem to be suspended in space, opening onto an emptiness that envelops us, arranged against backgrounds in a subtle range of greys, ochres and browns punctuated with red. His graphics are the other main element of his painting. Derived from ancestral oriental calligraphy, their lyricism invades the canvas. No symbolism or ideogram is to be sought in what become dreamlike landscapes, appealing to our imagination. In this recreated poetic space, each spectator can see whatever he or she wishes. These works are governed by a plastic cohesion that gives a depth of vision, to be found in mirage and illusion, which makes Chu one of the most sensitive painters of the lyrical abstract movement. In 1965 and 1967 there were exhibitions at the Galerie de l’Université. These were followed by a number of solo exhibitions in Paris, the French provinces and outside France. Among the group exhibitions that concern the period covered here, we should mention: 1956 La peinture d’aujourd’hui, Palais Royal, Paris. 1958 Peintres de l’École de Paris, Charlottenburg Museum, Copenhagen. 1959 Peinture d’aujourd’hui, Senlis, preface by Michel Ragon. 1960 École de Paris, Galerie Charpentier, Paris; Expression d’aujourd’hui, Lunéville. 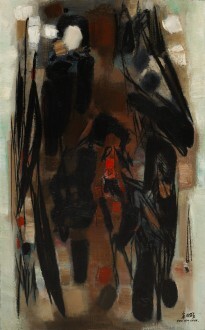 1962 Donner à voir, Galerie Creuze, Paris; L’œil de bœuf, Galerie 7, Paris; La boîte et son contenu, Galerie Le Gendre. 1964 50 jeunes peintres de la Nouvelle École de Paris, Galerie Merlin, Athens. He took part in the Salon des Réalités Nouvelles in 1958, 1959, 1965 and 1967; in the Salon de Mai in 1958, 1961 and regularly since 1971; and in the Salon Comparaisons in 1956. After 1974, Chu was regularly invited to take part in the Grands et Jeunes d’aujourd’hui. 1989 recent works at the Galerie Arlette Gimaray, Paris. Catalogue. Rétrospectives 1982 Musée des Beaux-Arts Le Havre. Peintures – Dessins 1955–1982. Catalogue. 1987 National Historic Museum of Taipei, Taiwan, Republic of China (ROC). Book catalogue. 1992 œuvres des années 60. Galerie Arlette Gimaray, Paris. Catalogue. Museums: Paris, d’Art Moderne de la Ville, Fonds National d’Art Contemporain – Dunkerque – Châteauroux – Nice – Le Havre – Marseille – Fondation Septentrion – Mairie de Sochaux and abroad in Taipei – Mexico – Saint Louis – Liège. Hubert Juin: Chu Teh-Chun, Le Musée de Poche, 1979. Pierre Cabanne: Chu Teh-Chun, visite d’atelier. Cimaise 204. 1990.